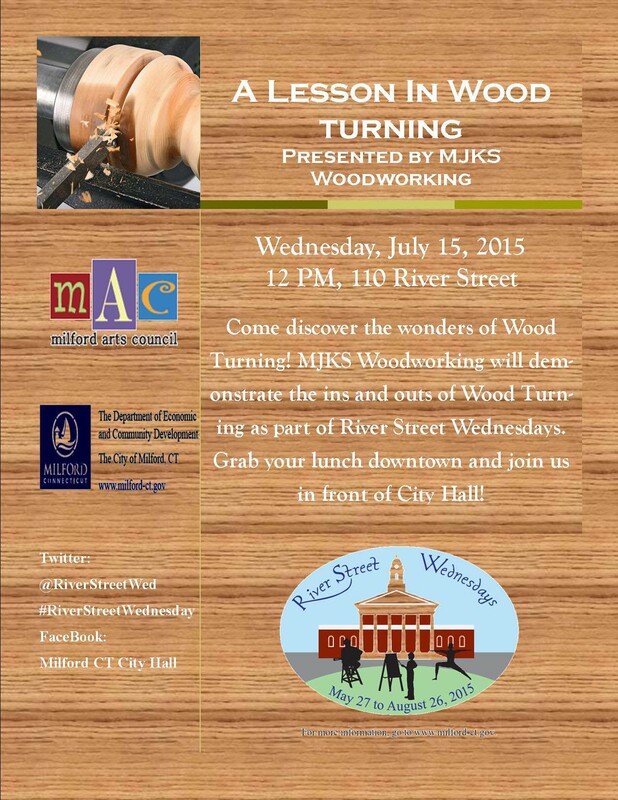 As part of the ongoing “River Street Wednesday” series here in Milford, Connecticut “A Lesson in Wood Turning” will be presented by MJKS Woodworking on July 15th, 2015 at 12pm on 110 River Street. Originally announced in April by Mayor Ben Blake and the Milford Arts Council, River Street Wednesdays are events that provides the community an opportunity to gather, connect and enjoy Downtown Milford together. Click on this link to read the press release for River Street Wednesdays put out in April and look to the right of this post to open the promotional image made for the upcoming event. A schedule of future River Street Wednesdays can be found in the press release. Attendees are encouraged to bring blankets/chairs as well as a picnic lunch. People can even get lunch at one of the numerous eateries downtown and bring it to this event coming up on the 15th. A list of restaurants and shops to visit before (and after) the events can be found at the website of the Downtown Milford Business Association. August 19 Pantochino Pop Up Theatre: Cinderella Italiano! Pantochino Productions Inc. This entry was posted in News and Events and tagged Ben Blake, City of Milford, Downtown Milford, Milford, Milford Arts Council, Milford Connecticut, River Street, River Street Wednesdays. Bookmark the permalink.